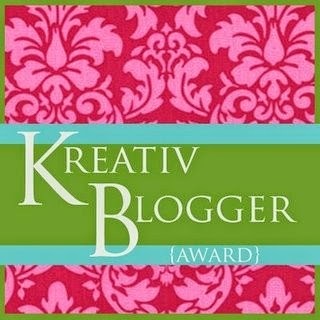 Earlier this week I was given a Kreativ Blogger award by beachgirl at Siestas and Sewing. It's very pleasant knowing that at least one person out there finds me "very creative" and enjoys my blog. Thank you very, very much! You warmed my heart! You know those "life lessons" that seem to come upon you one day and are strengthened as time passes? For me it's usually something simple that gets ahold of me in a profound way. Things like, "I'm a sinner" and what that really means. Simple truths that have the power to change the course of ones life. Recently it's been the fact that people -- all people and most especially bloggers -- desire affirmation. Since this profound realization hit me (I know, I know, it's not really such a novel idea, but it is still fresh to me), I have been making more effort to comment on people's blogs and forum posts rather than simply responding in my head like I tend to do. Scripture teaches that we are to value people, to love them as Christ loved them, and one way of doing that is showing them appreciation for the work that they do. As I pondered all this, I started wondering where this whole Kreativ Blogger award thing got started. A quick look on Google landed me at this post on Simon Food Favourites telling about how the award was started by Hulda in Norway who created the original image (with actual scrapbooking materials!) to give to four creative bloggers. Still, I was hesitant to nominate seven more people for the award. I really dislike email forwards and chain letters and "put this in your Facebook status for 1 hour" types of things. But rather than simply let it go, I decided much like Carol that I'd share with you the bloggers I look forward to reading time and time again. This way I have a good excuse for letting them know how much I appreciate them! Love Never Fails - for her lovely crafting and well-written, thought-provoking posts. Melody's Life - for her candid insight into motherhood with all its ups and downs. Solidity of Rainbows - for her creatively constructed posts about day-to-day life with five kids...love the tomato parade! I'm offering this award with no strings attached. Pass it on, if you like. Or just accept it, be cheered inside, and go on with life. You are awesome and you totally made my day!!!! Thank you!! You are so right that people in the blogging community love to have affirmation. I love it when someone decides to post a comment. It makes me feel like I'm actually interacting with people instead of writing about stuff that just ends up in outer space for some crazy cyber thief to take advantage of. Ha, ha. Not really, but I do appreciate every comment. I loved this,"Scripture teaches that we are to value people, to love them as Christ loved them, and one way of doing that is showing them appreciation for the work that they do." Amen!! Love it. Comments make me lightheaded with giddiness. It's nice to feel like you're talking to just more than yourself ;) Thank you uber-much and I will definately be paying it forward!